To Cite: Koochakzadeh L, Fekri K, Pakzad R, Khabazkhoob M. Comparison of the Therapeutic Effect of Anti-D IG and IVIG in Children with Acute Immune Thrombocytopenic Purpura Attending a Children’s Medical Center: A Randomized, Double-Blind, Controlled Clinical Trial, J Compr Ped. 2018 ; 9(1):e12334. doi: 10.5812/compreped.12334. Background: This study aimed at comparing the therapeutic effect of anti-D immunoglobulin (anti-D IG) and Intravenous Immunoglobulin (IVIG) in children with acute immune thrombocytopenic purpura (ITP). Methods: This Randomized double-blind, controlled clinical trial was conducted on 98 children attending a Children’s medical center during year 2008. The selected participants were allocated to IVIG and anti-D IG groups using the balanced-block randomization method. The platelet count, hemoglobin level, and side effects of the medications were evaluated on days 1, 3, 7, 14, and 21 after drug injection. Results: After drug injection, the platelet count increased in both groups (P < 0.001) yet there was no difference between the 2 groups (P > 0.05). The hemoglobin level also decreased after injection in both groups (P < 0.001) and the decrease was similar in both groups (P > 0.05). Regarding the ability of the drugs to increase the platelet count, 56% of the patients in the anti-D IG group and 52% of the children in the IVIG groups had platelet counts of more than 20 000 during the 24 hours after drug administration with no difference between the 2 groups (P = 0.836). The incidence of drug adverse effects, including fever and chills (4.1% in the anti-D group versus 10.4% in the IVIG group), severe hemolysis (4.5% in the anti D group versus 0% in the IVIG group) and headache (6.25% in the anti-D group versus 4.1% in the IVIG group), had no significant difference between the two groups (P > 0.05). Conclusions: Intravenous Immunoglobulin and anti-D have similar effectiveness in the treatment of children with acute ITP. Considering the fewer side effects of anti-D, it may be a suitable replacement for IVIG in ITP patients. Immune thrombocytopenic purpura (ITP) is an autoimmune disorder that causes rapid destruction of antibody-coated platelets in the reticuloendothelial system (RES), especially the spleen (1). It is the most common autoimmune disorder with an incidence of 1 in 100,000 individuals (2). Although this disorder has acute and chronic forms, its acute type is self-limited and thrombocytopenia usually resolves within weeks to months. This disorder has different clinical signs, including petechiae, mucosal bleeding, and ecchymosis (3), yet the most important finding of this disease is intracranial hemorrhage (4, 5). Although intracranial hemorrhage (ICH) is rare, it may result in serious complications, especially in children, and therefore its prevention is the primary objective of ITP treatment (2). Due to the importance of ICH, different studies have been performed to evaluate the drugs that increase platelet count in ITP patients, and different drugs have been recommended (6, 7). Intravenous Immunoglobulin is one of the most common drugs for the treatment of ITP (8). It increases the platelet count through decreasing the phagocytosis of platelets in the spleen by macrophages (9). However, it has been reported to have numerous adverse effects, such as flu-like syndrome (10), aseptic meningitis (11), hemiplegia (12), hemolytic anemia (13, 14), and the risk of hepatitis C transmission (8). Considering the above-mentioned adverse effects of IVIG, other methods of ITP treatment were investigated. Anti-D is one of these methods, which has recently received attention. Anti-D binds to D antigen on the RBC surface, preventing sensitivity to Rho (2) antigen (15). Although anti-D has minor adverse effects, such as headache, vomiting, fever, and chills (16), it is cheaper and more tolerable and has a more stable effectiveness in comparison with IVIG (17). Moreover, it has a very short time of infusion and single dose administration reduces the risk of infection in users (4). A number of studies have shown the greater potency of this drug versus IVIG in increasing platelet count in cases like ITP secondary to HIV infection (18, 19). Different studies have evaluated the effectiveness of anti-D in the treatment of ITP and have shown a similar (20, 21) or better effectiveness (19) as compared with IVIG. However, these studies are mostly retrospective and have different methodological errors. On the other hand, there are a few clinical trials, whose results are inconsistent due to small sample size and other errors (22-28). Considering these short-comings and the need for clinical trials with better design and due to a lack of such studies in Iran, the current study was conducted to compare the therapeutic effects of anti-D and IVIG in children with acute ITP, who were visited at the Children’s Medical Center. It is obvious that in case of similar effectiveness of anti-D and IVIG in the treatment of ITP, considering the advantages of anti-D, it could be a good replacement for IVIG. This randomized, double-blind, controlled clinical trial was conducted at the Children’s medical center during year 2008 with a parallel design considering the tenets of the Declaration of Helsinki. The objectives and outcomes of the study were explained to the parents of all children, and informed consent was obtained from parents, who were willing for their children to participate in the study. The parents were also assured that the study would not affect the treatment process of their child and that they could withdraw from the study at any time. Considering an effect size of 0.25, power of 80%, alpha of 0.05, and since 2 groups were evaluated, the final sample size was 98 (49 children in each group). The G-power software version 3.1.9.2 was used for data analysis (29). Since children under 15 years of age with acute ITP made up the study population, the inclusion criteria were: 1- RH positivity of the patient (for WinRho group), 2- platelet count of < 20,000 with mucosal involvement or < 10,000 with petechiae, 3- hemoglobin of > 8 (for Win Rho group), and 4- negative history of splenectomy. The exclusion criteria were: 1- severe life-threatening bleeding, 2- simultaneous low count of red or white blood cells, 3- lack of increase in the platelet count to at least 10,000/µL in the first 24 hours in the WinRho group, and 4- hemoglobin of < 8. First, 110 children with ITP, who were visited at the Children’s medical center were selected. Then, 10 were excluded considering the inclusion and exclusion criteria (5 due to hemoglobin of <8, 2 due to a positive history of splenectomy, and 3 due to severe bleeding). The parents of the remaining children received explanations on the objectives of the study and were requested to complete the informed consent form if they were willing for their children to participate in the study. Since 2 parents were unwilling, 98 children were finally selected for the study and allocated to anti-D and IVIG groups (Figure 1). The balanced-block randomization method in size of 4 was used for random allocation. The research analysis and statistics (RAS) software was used to produce random blocks. The drug used in the anti-D IG group was WinRho SDF, manufactured by Canagene. This drug is available in 120, 300, and 1000 IU vials. It was administered at a dose of 75 µg/kg in the current study; 300 µg (1500 IU) vials were used. Each vial was diluted with 2.5 mL of the diluent (NaCl 0.8%) available in the WinRho pack and injected intravenously at 300 µg/15 seconds. Shaking of the vial to dissolve the drug was avoided. The children, who received WinRho in an outpatient setting, were monitored for 1 hour for adverse reactions like fever, chills, and drug sensitivity. The criteria for outpatient treatment were age of over 4 years, a platelet count of above 10,000, and appropriate compliance of the parents. Patients in the IVIG group received IVIG at a dose of 1 g/kg/day for 8 to 12 hours in 2 days with gradual increments of the infusion rate and periodic control of blood pressure and heart rate. For double blinding, the vials (IVIG and anti-D IG) were labeled as A and B, so both the nurse in charge of injection and the patient were unaware of the type of medicine. The platelet count and hemoglobin level were measured on days 1, 3, 7, 14, and 21 after the intervention. The patients were evaluated for possible adverse reactions on each visit. Moreover, the data on gender, age, and baseline platelet count and hemoglobin level (before the intervention) were recorded. Data were analyzed with SPSS version 16. The Kolmogorov-Smirnov test was used to evaluate the normality of the data, and t test and chi-square test were used to compare baseline data. The effect of the drugs on the main outcome was assessed with repeated measure analysis of variance (ANOVA). Paired t test and chi-square test were used to evaluate the minimum time required for the drugs to take effect (the platelet count at baseline and 24 hours after the intervention) and the potency of the drugs to increase the platelet count (more than 200,000/mL), respectively. The number of adverse reactions in both groups was evaluated with Fisher’s exact test. Quantitative and qualitative data are presented as mean ± SD and percentages, respectively.P values of less than 0.05 were considered significant. After random allocation, one participant in the WinRho group (due to no increase in the platelet count to 10 000/µL in the first 24 hours) and one participant in the IVIG group (due to unwillingness to continue participation) were excluded from the study. In total, 96 patients participated in this study (response rate = 97.9%), of whom 48 were in the anti-D and 48 were in the IVIG group. All the required data were collected and there were no missing data. All quantitative variables in this study had a normal distribution. Table 1 shows the comparison of baseline data. The mean age of the patients was 4.7 ± 4.4 years in the anti-D and 3.8 ± 3.5 years in the IVIG group, respectively, which showed no significant difference (P = 0.18). Moreover, 66.7% and 58.7% of the participants in the anti-D and IVIG groups were boys, respectively, with no significant difference (P = 0.52). The results also showed that the baseline platelet count (P = 0.61) and hemoglobin level (P = 0.13) were not significantly different between the 2 groups. Quantitative and qualitative variables were presented as mean ± SD and number (percentage), respectively. Quantitative and qualitative variables were compared between the two groups using independent t test and chi-square test, respectively. Significance level was considered as 0.05. Use Repeated Measure ANOVA to analyses of within-subject, Between-subject and Interaction. The mean ± SD studied variables were presented in six time points. Significance level was considered as 0.05. Comparison of platelet count changes on days 1, 3, 7, 14, and 21 showed a significant increase (P < 0.001) in both groups with no significant difference between the groups (P = 0.417). Moreover, no interaction was observed between the type of drug and time (P = 0.463) (Table 2 and Figure 2). Comparison of hemoglobin level changes on days 1, 3, 7. 14, and 21 showed significant changes in the course of time (P < 0.001). The hemoglobin level decreased until 72 hours after the intervention yet had an increasing trend, 1, 2, and 3 weeks after the intervention. 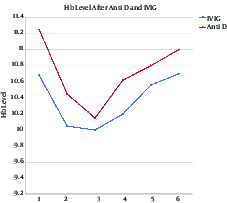 Moreover, comparison of the hemoglobin level between the 2 groups showed that it was higher in the WinRho versus the IVIG group, although the difference was not significant (P = 0.317). In addition, no interaction was observed between the type of drug and time (P = 0.413) (Table 2 and Figure 3). Comparison of the platelet count at baseline and 24 hours after the intervention showed a significant increase in the platelet count in both groups (P < 0.001 for both). Table 3 shows the comparison of the potency of the drugs to increase the platelet count to more than 20,000/mm3 after 24 and 72 hours. Comparison of the effect of IVIG and WinRho showed no significant difference in this regard; 56% and 52% of the children in WinRho and IVIG groups had a platelet count of more than 200,000 after 24 hours (P = 0.836) and 82% and 85% of the children in WinRho and IVIG groups had a platelet count more than 200,000 after 72 hours (P = 0.783), respectively. aUse Chi-square test for comparison of two study groups. Significance level was considered as 0.05. Table 4 shows the adverse effects in the study groups. In the current study, 4.1% and 10.4% of the children in WinRho and IVIG groups had fever and chills, and 4.5% and 0% of the patients in WinRho and IVIG developed severe hemolysis, respectively. Headache had a similar incidence in both groups. The results of Fisher’s exact test showed no significant difference in the incidence of adverse effects between the 2 groups (P > 0.05). bUse fisher exact test for comparison of complication between two study groups. Significance level was considered as 0.05. The results of the current study showed a similar effectiveness for IVIG (2 g/kg/2days) and anti-D (75 µL/kg) in the treatment of children with acute ITP. The results showed that both drugs similarly increased the platelet count in children with acute ITP. Both drugs also markedly increased the trend of platelet count elevation after 72 hours. These findings indicate the similar effect of IVIG and anti-D in the treatment of acute ITP in children. Other studies have also reported similar findings (30, 31). Although these drugs have different mechanisms of action (IVIG suppresses the Fc receptor and anti-D binds to host antigens), they both increase platelet survival eventually through blocking the RES (15). Amongst the main issues, the treatment process of ITP is to increase the baseline platelet count to more than 20,000/mm3. The current study showed no significant difference between IVIG and WinRho in increasing the platelet count to more than 20,000/mm3 after 24 hours, as 56% of the children in WinRho and 52% in the IVIG group had a platelet count of more than 20,000/mm3 after 24 hours. The situation was similar after 72 hours, as well. Other studies have also reported similar results. Tarantino et al. found that anti-D at a dose of 45 to 50 µg/kg and IVIG at a dose of 0.8 to 1 g/kg had similar effects in increasing the platelet count and that the required time to increase the platelet count to more than 20,000/mm3 was similar for both drugs (30). Hemoglobin decrease in ITP patients is another issue that warrants attention in the treatment of these patients. The current study showed that the hemoglobin level decreased until 72 hours after the intervention yet increased 1, 2, and 3 weeks thereafter. However, no difference was observed between the 2 groups in this regard. Different studies have reported decreased hemoglobin levels after IVIG and anti-D administration (4, 18, 19, 32). The decrease may also be dose-related; the decrease has been reported to be 1.6, 2, and 0.3 g/dL in those receiving 50 µg/kg and 75 µg/kg of anti-D, and IVIG, respectively (30). However, lack of a marked difference in the decreased hemoglobin level between IVIG and anti-D indicates the similar effect of these drugs. Considering the higher stability and more tolerability of anti-D, it may be a good replacement for IVIG (17). This study found no significant difference in adverse effects between IVIG and anti-D. Participants in both groups experienced fever and chills, which is predictable and acceptable considering the drug type. Although older patients are more likely to suffer from severe bleeding or debilitating adverse effects, children may also experience adverse reactions like fever, chills, hypotension, and bronchial spasm. Other studies have also reported similar adverse reactions for IVIG (33, 34) and anti-D (35). The most important adverse effects in the current study was severe lysis in 2 children aged less than 3 months in the anti-D group while no cases of severe lysis were observed in the IVIG group. Yacobovich et al. also reported severe lysis in ITP patients, who received anti-D. However, the authors reported that severe lysis was a rare adverse effect of anti-D and believed that it was a safe drug for the treatment of ITP (31). In general, it could be stated that anti-D, at a dose of 75 µg/kg, and IVIG, at a dose of 1 g/kg/day, have no significant difference in the treatment outcome and drug adverse effects for the treatment of children with ITP. Therefore, since anti-D is less expensive than IVIG and its administration is easier, it may be a good replacement for IVIG in children with acute ITP. Disclosure: The authors report no conflicts of interest. The authors alone are responsible for the content and writing of this manuscript. 1. Segel GB, Feig SA. Chronic Complex Diseases of Childhood: A Practical Guide for Clinicians. Morimoto K. Immune Thrombocytopenic Purpura (ITP). In: Yazdani S, McGhee S, Stiehm ER, editors. Florida, Unaited States: Brown Walker Press, Boca Roton; 2011. p. 268-71. 2. Orkin SH, Nathan DG, Ginsburg D, Look AT, Fisher DE, Lux S. Nathan and Oski's Hematology of Infancy and Childhood E-Book. Elsevier Health Sciences; 2008. 3. Lusher JM, Zuelzer WW. Idiopathic thrombocytopenic purpura in childhood. J Pediatr. 1966;68(6):971-9. [PubMed: 5949017]. 4. Tarantino MD, Madden RM, Fennewald DL, Patel CC, Bertolone SJ. Treatment of childhood acute immune thrombocytopenic purpura with anti-D immune globulin or pooled immune globulin. J Pediatr. 1999;134(1):21-6. [PubMed: 9880444]. 5. Psaila B, Petrovic A, Page LK, Menell J, Schonholz M, Bussel JB. Intracranial hemorrhage (ICH) in children with immune thrombocytopenia (ITP): study of 40 cases. Blood. 2009;114(23):4777-83. doi: 10.1182/blood-2009-04-215525. [PubMed: 19767509]. 6. Ahn YS, Harrington WJ. Treatment of idiopathic thrombocytopenic purpura (ITP). Annu Rev Med. 1977;28:299-309ENG. doi: 10.1146/annurev.me.28.020177.001503. [PubMed: 324364]. 7. Cines DB, Bussel JB. How I treat idiopathic thrombocytopenic purpura (ITP). Blood. 2005;106(7):2244-51. doi: 10.1182/blood-2004-12-4598. [PubMed: 15941913]. 8. Bussel JB, Hilgartner MW. The use and mechanism of action of intravenous immunoglobulin in the treatment of immune haematologic disease. Br J Haematol. 1984;56(1):1-7. [PubMed: 6367804]. 9. Bussel JB. Fc receptor blockade and immune thrombocytopenic purpura. Semin Hematol. 2000;37(3):261-6. [PubMed: 10942220]. 10. Chapel HM, Spickett GP, Ericson D, Engl W, Eibl MM, Bjorkander J. The comparison of the efficacy and safety of intravenous versus subcutaneous immunoglobulin replacement therapy. J Clin Immunol. 2000;20(2):94-100. [PubMed: 10821460]. 11. Sekul EA, Cupler EJ, Dalakas MC. Aseptic meningitis associated with high-dose intravenous immunoglobulin therapy: frequency and risk factors. Ann Intern Med. 1994;121(4):259-62. [PubMed: 8037406]. 12. Tsiouris J, Tsiouris N. Hemiplegia as a complication of treatment of childhood immune thrombocytopenic purpura with intravenously administered immunoglobulin. J Pediatr. 1998;133(5):717. [PubMed: 9821443]. 13. Berard R, Whittemore B, Scuccimarri R. Hemolytic anemia following intravenous immunoglobulin therapy in patients treated for Kawasaki disease: a report of 4 cases. Pediatr Rheumatol Online J. 2012;10(1):10. doi: 10.1186/1546-0096-10-10. [PubMed: 22507284]. 14. Markvardsen LH, Christiansen I, Harbo T, Jakobsen J. Hemolytic anemia following high dose intravenous immunoglobulin in patients with chronic neurological disorders. Eur J Neurol. 2014;21(1):147-52. doi: 10.1111/ene.12287. [PubMed: 24180709]. 15. Lazarus AH, Crow AR. Mechanism of action of IVIG and anti-D in ITP. Transfus Apher Sci. 2003;28(3):249-55. doi: 10.1016/S1473-0502(03)00043-0. [PubMed: 12725951]. 16. Imbach P, Kuhne T. Sequelae of treatment of ITP with anti-D (Rho) immunoglobulin. Lancet. 2000;356(9228):447-8. [PubMed: 10981885]. 17. Simpson KN, Coughlin CM, Eron J, Bussel JB. Idiopathic thrombocytopenia purpura: Treatment patterns and an analysis of cost associated with intravenous immunoglobulin and anti-D therapy. Semin Hematol. 1998;35(1 Suppl 1):58-64. [PubMed: 9523750]. 18. Newman GC, Novoa MV, Fodero EM, Lesser ML, Woloski BM, Bussel JB. A dose of 75 microg/kg/d of i.v. anti-D increases the platelet count more rapidly and for a longer period of time than 50 microg/kg/d in adults with immune thrombocytopenic purpura. Br J Haematol. 2001;112(4):1076-8. [PubMed: 11298610]. 19. Scaradavou A, Woo B, Woloski BM, Cunningham-Rundles S, Ettinger LJ, Aledort LM, et al. Intravenous anti-D treatment of immune thrombocytopenic purpura: experience in 272 patients. Blood. 1997;89(8):2689-700. [PubMed: 9108386]. 20. Imbach P, Barandun S, d'Apuzzo V, Baumgartner C, Hirt A, Morell A, et al. High-dose intravenous gammaglobulin for idiopathic thrombocytopenic purpura in childhood. Lancet. 1981;1(8232):1228-31. [PubMed: 6112565]. 21. Cooper N, Heddle NM, Haas M, Reid ME, Lesser ML, Fleit HB, et al. Intravenous (IV) anti-D and IV immunoglobulin achieve acute platelet increases by different mechanisms: modulation of cytokine and platelet responses to IV anti-D by FcgammaRIIa and FcgammaRIIIa polymorphisms. Br J Haematol. 2004;124(4):511-8. [PubMed: 14984503]. 22. Alioglu B, Ercan S, Tapci AE, Zengin T, Yazarli E, Dallar Y. A comparison of intravenous immunoglobulin (2 g/kg totally) and single doses of anti-D immunoglobulin at 50 mug/kg, 75 mug/kg in newly diagnosed children with idiopathic thrombocytopenic purpura: Ankara hospital experience. Blood Coagul Fibrinolysis. 2013;24(5):505-9. doi: 10.1097/MBC.0b013e32835e5337. [PubMed: 23470649]. 23. Celik M, Bulbul A, Aydogan G, Tugcu D, Can E, Uslu S, et al. Comparison of anti-D immunoglobulin, methylprednisolone, or intravenous immunoglobulin therapy in newly diagnosed pediatric immune thrombocytopenic purpura. J Thromb Thrombolysis. 2013;35(2):228-33. doi: 10.1007/s11239-012-0801-z. [PubMed: 22956408]. 24. Dolman C, Thorpe SJ, Thorpe R. Enhanced efficacy of anti-D immunoglobulin for treating ITP is not explained by higher immunoglobulin polymer content. Biologicals. 2001;29(2):75-9. doi: 10.1006/biol.2001.0279. [PubMed: 11580212]. 25. El Alfy MS, Mokhtar GM, El-Laboudy MA, Khalifa AS. 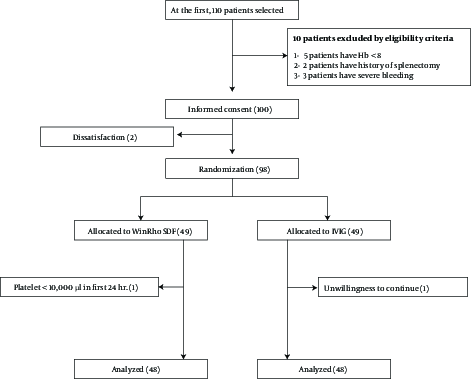 Randomized trial of anti-D immunoglobulin versus low-dose intravenous immunoglobulin in the treatment of childhood chronic idiopathic thrombocytopenic purpura. Acta Haematol. 2006;115(1-2):46-52. doi: 10.1159/000089465. [PubMed: 16424649]. 26. Kane I, Ragucci D, Shatat IF, Bussel J, Kalpatthi R. Comparison of intravenous immune globulin and high dose anti-D immune globulin as initial therapy for childhood immune thrombocytopenic purpura. Br J Haematol. 2010;149(1):79-83. doi: 10.1111/j.1365-2141.2009.08057.x. [PubMed: 20096011]. 27. Shahgholi E, Vosough P, Sotoudeh K, Arjomandi K, Ansari S, Salehi S, et al. Intravenous immune globulin versus intravenous anti-D immune globulin for the treatment of acute immune thrombocytopenic purpura. Indian J Pediatr. 2008;75(12):1231-5. doi: 10.1007/s12098-008-0243-y. [PubMed: 19190878]. 28. Son DW, Jeon IS, Yang SW, Cho SH. A single dose of anti-D immunoglobulin raises platelet count as efficiently as intravenous immunoglobulin in newly diagnosed immune thrombocytopenic purpura in Korean children. J Pediatr Hematol Oncol. 2008;30(8):598-601. doi: 10.1097/MPH.0b013e31817541ba. [PubMed: 18799936]. 29. Faul F, Erdfelder E, Buchner A, Lang AG. Statistical power analyses using G*Power 3.1: tests for correlation and regression analyses. Behav Res Methods. 2009;41(4):1149-60. doi: 10.3758/BRM.41.4.1149. [PubMed: 19897823]. 30. Tarantino MD, Young G, Bertolone SJ, Kalinyak KA, Shafer FE, Kulkarni R, et al. Single dose of anti-D immune globulin at 75 microg/kg is as effective as intravenous immune globulin at rapidly raising the platelet count in newly diagnosed immune thrombocytopenic purpura in children. J Pediatr. 2006;148(4):489-94. doi: 10.1016/j.jpeds.2005.11.019. [PubMed: 16647411]. 31. Yacobovich J, Abu-Ahmed S, Steinberg-Shemer O, Goldberg T, Cohen M, Tamary H. Anti-D treatment for pediatric immune thrombocytopenia: Is the bad reputation justified? Semin Hematol. 2016;53 Suppl 1:S64-6. doi: 10.1053/j.seminhematol.2016.04.019. [PubMed: 27312170]. 32. Blanchette V, Adams M, Wang E, McMillan J, Imbach P, Andrew M, et al. Randomised trial of intravenous immunoglobulin G, intravenous anti-D, and oral prednisone in childhood acute immune thrombocytopenic purpura. Lancet. 1994;344(8924):703-7. doi: 10.1016/s0140-6736(94)92205-5. 33. Duhem C, Dicato MA, Ries F. Side-effects of intravenous immune globulins. Clin Exp Immunol. 1994;97 Suppl 1:79-83. [PubMed: 8033440]. 34. Katz U, Shoenfeld Y. Review: intravenous immunoglobulin therapy and thromboembolic complications. Lupus. 2005;14(10):802-8. doi: 10.1191/0961203303lu2168rr. [PubMed: 16302674]. 35. Eghbali A, Azadmanesh P, Bagheri B, Taherahmadi H, Sadeghi Sedeh B. Comparison between IV immune globulin (IVIG) and anti-D globulin for treatment of immune thrombocytopenia: a randomized open-label study. Fundam Clin Pharmacol. 2016;30(4):385-9. doi: 10.1111/fcp.12198. [PubMed: 26991138].